MAN 8.153, Meiller 3 Seiten, AHK, 3 Sitze. The price is set up at the amount of 9900 Euro. 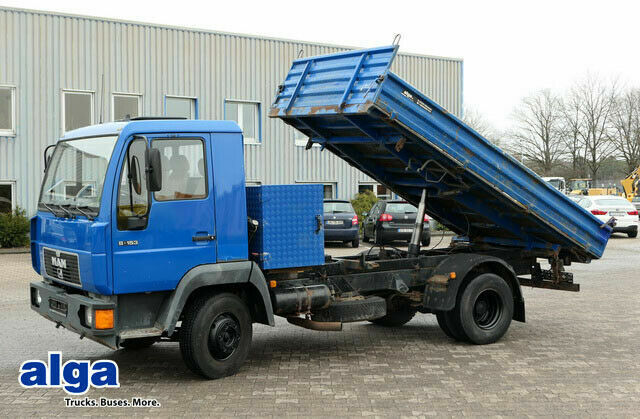 All the offers in the stock of MAN tipper are up-to-date as well as in good shape. The year of production is 1997. Engine details/gearing and fuel type: Euro 1, diesel, 155 hp, gearbox: manual. Wheel formula and suspension type: ABS, trailer coupling. Cab comforts include power steering, number of seats: 3. Body dimensions and options: loading length: 3820 mm, loading width: 2215 mm, loading height: 415 mm. The mileage is 265553 km.